Artificial intelligence (“AI”) can be loosely defined as “intelligence as exhibited by machines”. When people think about AI there are several assumptions that derive from how AI has been portrayed in popular movies, such as “Terminator”, “I, Robot” and “Ex Machina”, that all depict robots as a threat to humans. AI is not all just robots. It also applies to anything that fits the above definition. The Internet of Things (“IoT”), virtual personal assistants, smart cars, Google searches, Apple’s Siri and Amazon’s Echo are just some examples of current AI applications. AI can transcend across all sectors (i.e. banking, education, healthcare and transport) and is slowly becoming a very natural part of our everyday lives. One such example is a British student has compiled software that is essentially an “AI lawyer” that can sort out what to do with the received parking ticket based on a few questions. As of June 2017, it had successfully appealed between 160,000 of 250,000 parking tickets in both London and New York, giving it a 64% success rate. Many commentators believe that AI is an evolution in computing that is more important than the shifts to mobile or cloud computing. Steve Case (the famous entrepreneur and co-founder of AOL) in his book “The Third Wave: An Entrepreneur’s Vision of the Future” describes the new era we are entering of immense technological advancements that are transforming virtually every non-digital sector of the economy, including education, healthcare, our food system, and beyond. The First Wave was the creation of the internet and the foundation of our online world. The Second Wave saw companies like Google and Facebook build on top of the Internet to create search and social networking capabilities, while apps like Snapchat and Instagram leveraged the smartphone revolution. We have now reached the third wave: a period in which entrepreneurs will vastly transform major “real world” sectors of the economy like health, education, transportation, energy, and food – and in the process change the way we live our daily lives. Case’s Third Wave is about applying the Internet and technology, including AI (artificial intelligence) to solve important issues such as hunger, disease and crime. The examples given below, illustrate how the UAE is already in the process of undertaking the Third Wave. UAE, AI and Internet of Things: a golden opportunity? Why are AI and the IoT important for the UAE? In March 2014, the Dubai Government announced the Smart Dubai initiative to make Dubai a leading smart city. AI has been the trigger and the technology behind the facilitation of Smart Dubai. This was undoubtedly also based on the predictions that over the next five years the smart cities market will increase from over $400 billion to $1.5 trillion. This would set Dubai on a global pedestal as a nest for innovation and technological advances in fields such as education and healthcare and would provide a steady growth incline for the UAE as a whole. The one that is perhaps the most interesting is Smart Life. Smart Life deals with health, educational, transport, communications, public utilities and energy services. Smart Life not only offers innovation to the region but it offers a strong economic gain if it is steered properly. Data management; including data storage and collection so as to streamline medical records. (One example of this is Google Deepmind). Designing treatment plans: such as IBM Watson’s special program for oncologists that analyze structured and unstructured data in medical records and clinical notes to create bespoke and select treatments. Online consultants, health assistance via virtual appointments or nurses including drug creation and medical expertise. These are just some of the areas where the UAE is well placed to capitalize. The way in which these are implemented is through the creation of the right medium between a strict and flexible legal framework. The introduction of driverless cars has been anticipated since Dubai’s transport authority, the RTA bought 200 Tesla vehicles. Driverless, due to the disruptive nature of the technology, is a prime example of where the law needs to evolve. Self driving cars and other devices that connect to telecommunication networks to enable AI and IOT need to seek type approval from the Telecommunications Regulatory Authority (“TRA”). The TRA provides a safety net, one that is trying to strike the balance between allowing flexibility for innovation and creating infrastructure to protect the general public. The more advanced the AI environment becomes the greater pressure there is for the legal environment to change. There are two opposing arguments, one which demands less formalization of rules and regulations and allows the technology to evolve naturally and the other, which tightens regulation and constricts the parameters by which technology is bound. Lawmaking by its nature is reactive to changes in society rather than being proactive. No matter how quick governments try to be with implementing regulations that deal with up to date issues we will always be lagging. 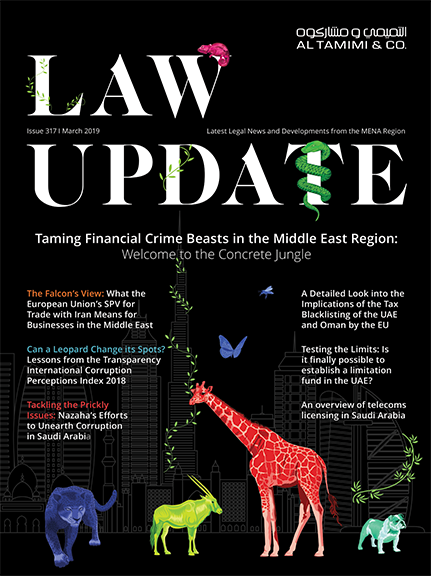 Suggestions that can aid the growth of technology within a safe legal environment, such as the incubator regimes for FinTech in the DIFC and ADGM financial free zones, are likely more productive. It is clear that the UAE is committed and dedicated to innovation and technology. Mubadala alone was reported to be investing US$15 billion in a technology fund, and with Smart Dubai shifting focus away from the traditional sectors the UAE, with the combination of legal support and push for innovation, is poised to become a hub for innovation. However the spread of AI and IOT raises questions that our laws will need to adequately address: whether it is from a moral perspective, a resource perspective, an emotional perspective or one of innovation. It is not just restricted to a world where our fridge tells us what we are missing and what items need to be bought, where our car knows when to slow down or take an alternative route due to traffic – but extends to healthcare or where robots fight our wars based on pre programming of what is right and wrong. Al Tamimi & Company’s Technology, Media & Telecommunications team regularly advises on AI or IoT commercial and regulatory related issues. For further information please contact Eleonore Kressner (e.kressner@tamimi.com).